This post is contributed by Nancy Halter, one of Long Lake’s newest “year-round” residents. She’s been living here in the summers and just this past season she and her husband, Dave, have made Long Lake their permanent home. They are embracing the community and this webmaster asked Nancy if she would be willing to share her experiences with everyone. This is Nancy’s Long Lake story.. in her own words! My first introduction to Long Lake was camping at Lake Eaton Campground, a place where my husband Dave, had spent every summer of his childhood. While camping there one summer, we met some friendly locals, Jeff and Cindy Rutherford, and heard about land for sale on Beecher Park Road, right on Lake Eaton. Talk about being in the right place at the right time! Long story short, we were fortunate to be able to purchase the land and build our dream retirement/summer home. While still living and working in New Jersey Dave and I would come up to Long Lake every chance we’d get. I was an art teacher and had the entire summer off from school and Dave ran his own business (Halter’s Cycles) so we were here a lot (escaping New Jersey!) Now, about 12 years after buying and building on Lake Eaton, we’ve retired and have moved to Long Lake permanently. Yes, Long Lake people, you are stuck with us! Now, about this town. This is an incredibly beautiful, musical, artsy, friendly and fun community which I fondly refer to as “Mayberry.” There is so much to do here! Unbelievable for such a small community. Thinking back, my first memories are of the weekly pool tournaments at “The Blarney Stone” restaurant. Being new in town, Dave and I hardly knew anyone but we met some of our closest friends over the table. We had to compete with some real “pool sharks” like Tim McIntyre, Jeff Rutherford and Bob Kissmann. The pool group has continued this tradition for many years now, although the location has changed after the Blarney Stone sadly burned down. Long Lake is full of artists. ! I love it and feel right at home. I’ve met so many musicians, writers, painters, and crafts people here. I think Long Lake draws artistic souls. My favorite monthly event is the Open Mic at the Adirondack Hotel, which takes place the last Saturday of the Month. Terry and Wayne Chaikin host the monthly get-together which was previously hosted by Eric Peter. Anyone can sign up for a spot to perform. Just bring your voice or your instrument. The whole town usually shows up for this fun event. 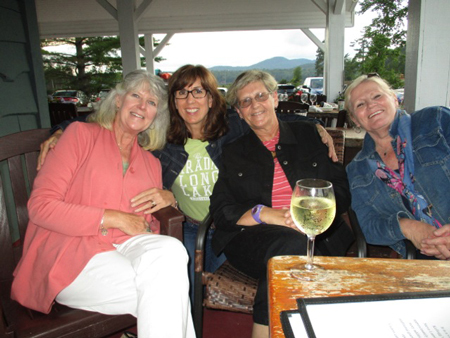 Nancy and her friends enjoy the porch at the Adirondack Hotel. Ah, the Adirondack Hotel, the town meeting place…. there’s nothing more relaxing than sitting on the porch in the rocking chairs talking with friends and looking at the lake. 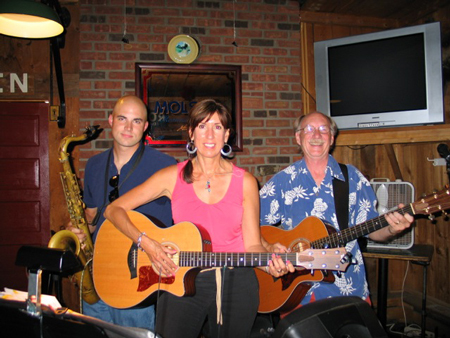 Every Wednesday night in the summer my musical partner, John Weyl and I enjoy singing and playing guitar for the Hotel patrons. We call ourselves “Blue Bandana”. Over the past 5 years we’ve met all kinds of musicians from all over the world that have “sat in” and played with us. We’ve had trumpet, saxophone, mandolin, guitar and keyboard players join us and some come back every summer. Now if you like to write, there’s the “Creative Writers Workshop” lead by Gail Huntley that meets once a week at the Long Lake Library in the summer. This group includes published authors, songwriters like myself and others who enjoy writing poetry, short stories or comedy. We have two open mics each summer to share what we have produced. Over the years I’ve written several songs with the help and encouragement of this group. 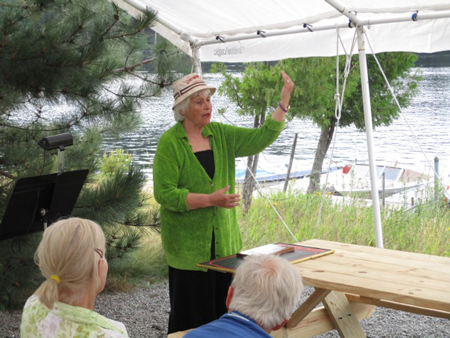 The Lakeside Knoshery and Boat Tours hosts the Writer’s Open Mikes in the summer months. There is also a group of painters that meet weekly at the Geiger Center at Mt. Sabattis in the summer. We bring our supplies and sit together while painting and chatting. Some of these same artists show and sell their art in the Summer Art Exhibit at the Town Hall. This is my first full winter in Long Lake and it has sure been a snowy one so far. I’m learning to dress in layers. It’s funny, I had no idea there would be snow on the ground every single day, but I’m finding it absolutely beautiful! Dave and I have joined the Adirondack Mountain Club and this group is full of some very rugged, healthy and outdoorsy types. I’m not sure this Jersey girl can keep up! 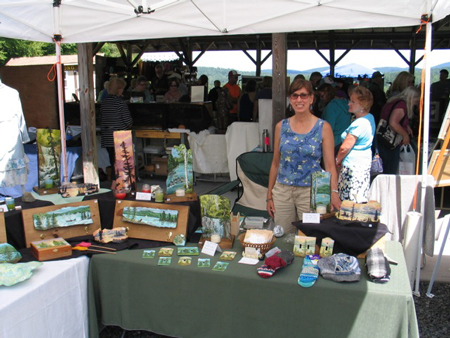 They organize all kinds of hiking, kayaking, canoeing, snow shoeing and skiing events. 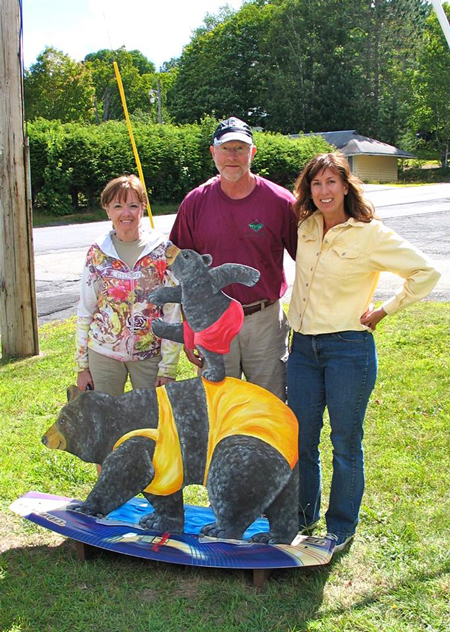 Through this group, Jackie Mallery offers cross -country skiing lessons. I’ve survived one lesson so far and am looking forward to mastering this skill. Jackie is a wonderful teacher, especially for a beginner like me. There is so much more to say about this delightful town. The “Cardboard Boat Float Boat” contest, the Heart of the Park Craft Fair, the 4th of July Celebration and fireworks, the Winter Carnival and of course all of the special people who live here! Last but not least, I want to mention the wonderful community of faith that I’m a part of at the Long Lake Wesleyan Church. I love being able to use the musical gifts God gave me to help lead the congregation in song each Sunday. Snow! Thanks to our neighbor and friend who keeps the driveway plowed. I’m loving our first snowy winter in Long Lake. So as you can probably guess, Dave and I are pretty happy with our decision to retire here to Long Lake. There are a few things to get used to, like the cold, snowy winters and having to drive far distances to get things you need but it’s worth it to live in this beautiful place. And there’s always Amazon.com! The UPS guy is at our house every other day.